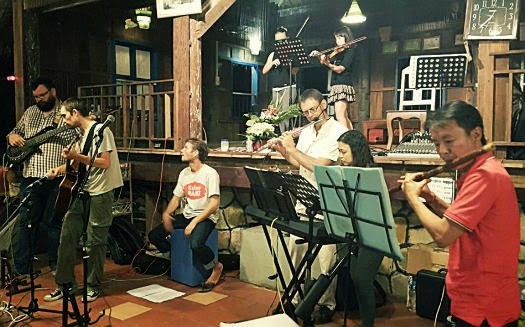 The members of Drakkar Band are living legends – survivors of the 'Golden Era' of Cambodian pop music. Their original album of psychedelic rock'n'roll was recorded in Cambodia in the early-to-mid seventies and released on cassette tape in 1974. In 1975, the self-marketed, self-distributed masterpiece became the biggest-selling album in Cambodian history when more than 40,000 cassette copies were sold. Before the band could order another production run of 'Drakkar 74', the general situation in Cambodia took a sudden and drastic turn for the worse. The vast majority of Cambodian musicians and artists were destroyed by the Khmer Rouge over the next few years, along with the work they had produced. Mr. Touch Tana (lead vocals/guitar), Mr. Ouk Sam Ath (drums) and Mr. Touch Chhatha (guitar) are still very much alive and kicking (and rocking). An arc of rock'n'roll history will reach its long-awaited conclusion next month when Drakkar Band travel to the U.S.A. to take part in a series of live concerts. 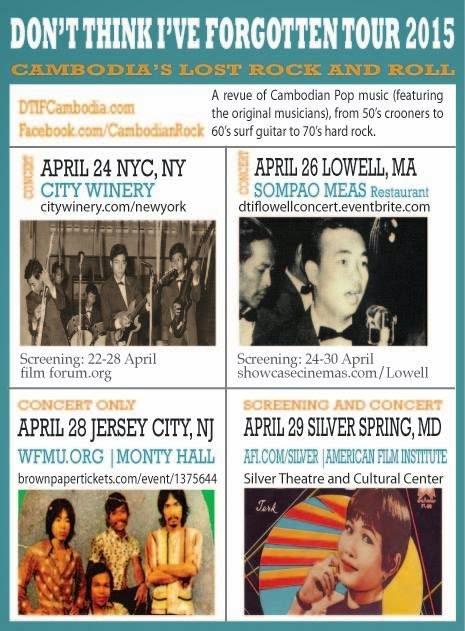 The tour, featuring many legends of Cambodian music, will take place in conjunction with public screeenings of John Pirozzi's celebrated 'Golden Era' music documentary Don't Think I've Forgotten. In the meantime, Phnom Penh gig-goers have an opportunity to see Drakkar Band performing their only pre-US Tour show at Sharky Bar this Friday. Leng Pleng readers viewing this before 5.30pm (Cambodian time) on Thursday afternoon (26th March 2015) still have time to compete in an auction to win a very special Drakkar Band prize. The highest bidder will win a signed copy of the extremely-limited 12-inch vinyl edition of Drakkar 74. This iconic and celebrated album of Cambodian psychedelic rock has been re-released this month by Metal Postcard records, making the recording generally available again for the first time in 40 years. 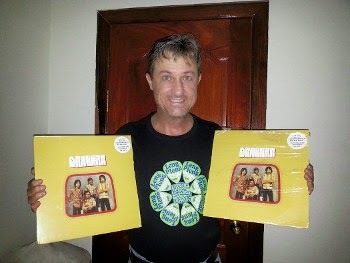 The album cover will be signed in person by the three surviving members of the original band at Sharky Bar on Friday night. Check out the video below to see the band in action at Sharky's during last year's Penhstock festival. The winner of the auction must be present (or have a representative present) at the Drakkar Band gig on Friday. To compete in the auction, click here to place a bid via the Leng Pleng Facebook page. Click here to see the full rules for bidding. Kheltica will attempt to squeeze most of their members on to the Slur Bar stage on Saturday. The lively, rabble-rousing outfit rarely like to perform with less than eight or so players, ensuring a wall-of-Celtic-sound produced by flutes, violins, piano, guitars and whatever else they can get their hands on. The man at the forefront of all of this is the fervently Scottish Chris Bradbury, who spurs Kheltica on with energetic, Shane MacGowan-esque vocal performances. Chris plans to head back to Scotland soon – Saturday's gig at Slur might be his last ever with the band. Lewis Pragasam continues his weekly Drum Jam on Sunday afternoon at the newly-established Starworks music academy, located at the LYLA Center. Check out the video below – looks like a lot of fun! The Belly Dancer and Lewis Pragasam from sonny krishnan on Vimeo. A classy evening of jazz can be enjoyed on Wednesday night at Doors Phnom Penh. The Kae Lhassan Quartet comprises of the fabulous Kae on vocals, together with Toma Willen (drums), Seb Adnot (guitar) and Nono (violin). Expect jazz-manouche-flavoured renderings of classic songs, and a very high level of musicianship. Check out the 'hidden gem' of a video below from a few years back: Kae's rendition of 'My Favourite Things'. Whatever you're up to over the next few days, be safe out there and... see you around the traps!